At some point, I was lucky enough to realize that I have two great loves in life: the outdoors and community. And with that comes a personal interest in the health of my neighbors, in building social capital, in equity, in a green and growing natural environment, in fun and quality of life, and in taking an active role in making all of that possible.... and, fortunately for me.... I also realized that there's a profession that lets me impact every one of those ideals in a big and meaningful way. Jean has over ten years of experience in planning for mobility alternatives. She leads Alta’s New Mobility Group and applies her hands-on experience in program development, community engagement, and project implementation to every project. 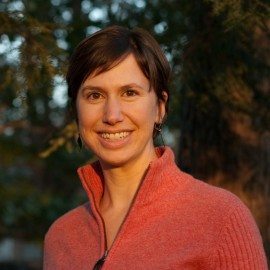 She is a national leader in bike share policy, business models, and funding options and works closely with Alta staff and clients to plan for new technology and infrastructure in the public right-of-way. Jean also co-leads Alta’s Health and Equity group, seeing that health and equity are integrated into planning efforts throughout the country. Jean sits on the new Transportation Research Board’s forum on automated vehicles, an industry-academic-public sector roundtable of experts on connected and automated vehicle research and deployment.